The Engineering, Experimentation, Exploration Fair brings together middle school students from across Monroe County to display their science and engineering experiments and compete against each other for prizes. A science, engineering and technology design contest by area middle school students takes place at the annual Engineering, Experimentation, Exploration Fair from 9 a.m. to 2 p.m. April 29 in Clark Gymnasium at Rochester Institute of Technology. More than 500 students from Monroe County schools are expected to participate in one of the largest engineering and science competitions. It is free and open to public. 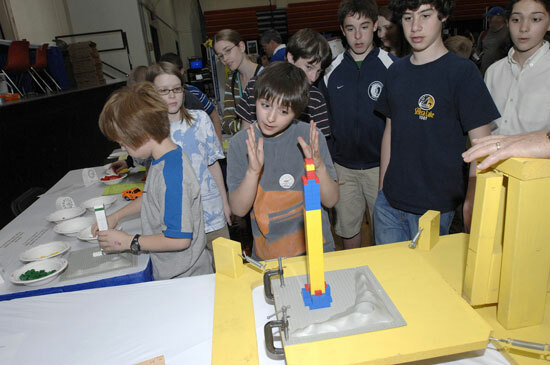 The Engineering, Experimentation, Exploration Fair, known as the E-Cubed Fair, began in 1991 for middle school students to learn more about the field of engineering. Twenty years later, the event has grown but remains a community-based event, from participants to sponsors. “The very first year, it was such an exciting event,” says Satish Kandlikar, professor of mechanical engineering in RIT’s Kate Gleason College of Engineering and one of the founding members of the event. Organizers in 1991 debated between a booth in a local mall or a more hands-on approach for the event. “We quickly decided that we needed to go to the target audience rather than trying to ‘fish them out’ in the mall,” he says. Twenty years later, local middle schools and charter schools as well as numerous home-schooled students participate at the full day event, says Jayanti Venkataraman, professor of electrical engineering at RIT. As part of the organizing committee, she is responsible for specifying the design projects and conducting the competitions. The guidelines for the projects are announced about four months prior to the fair, she explains. Examples of the projects include a robot navigating through a maze and timed for how quickly it gets to the finish or a LEGO machine lifting weights to a specified height in a specified time. On the day of the fair student teams bring their projects and compete for individual prizes and school trophies. “The students work in pairs and are judged on presentation, quality of the project and the way they have organized it. Students also submit design journals that are graded as part of the fair,” she adds. Community engineering professionals and RIT graduate students and upperclassmen act as judges for the competition. “There’s a very nice mentoring of school kids by the college students,” says Venkataraman. There are usually 50 displays of student experiments and 30 displays from RIT student design classes, campus chapters of the national engineering societies and clubs, says Brian Thorn, associate professor in RIT’s industrial and systems engineering department. He oversees event setup that also includes local engineering professionals as exhibitors. “Over the years, we have been able to integrate this fair into the Rochester community,” says Kandlikar. The focus has remained on promoting engineering as a career option, and students from the earliest fairs to the most current have not changed all that much, he adds. Venkataraman agreed. “I think that students are very motivated, very aggressive competitors. They go to most of the science and math the tournaments that are offered in the area. We get a large number of girls in this fair. They are very good; they win a good number of the awards,” she says. The fair has a dual objective, she adds, of reinforcing girl’s participation in science and engineering beyond middle school. In the next several years, organizers look to train high school students as mentors for the middle school participants, and possibly developing a regional competition, says Kandlikar. Sponsors of the Rochester event are the Rochester Engineering Society and Rochester chapters of the Institute of Electrical and Electronics Engineers and the American Society of Mechanical Engineers, and the Kate Gleason College of Engineering.